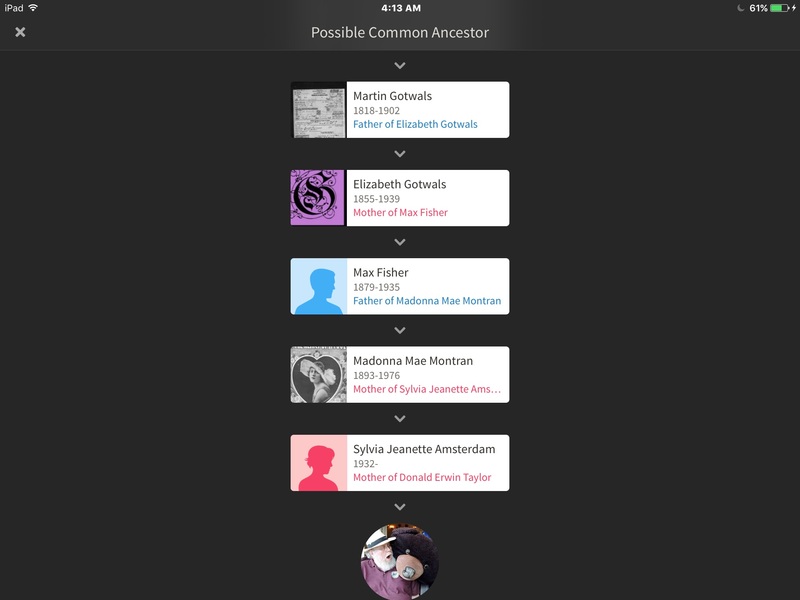 Certainly, one of the fun, new apps from Ancestry is their app, “We’re Related.” I’ve seen several genealogy friends talk about the app and thought I’d see who I’m related to. Randy Seaver, in his blog Genea-Musings, speaks about his connections in the sense of likely, possible, and unlikely. I thought it might be fun to see who I’m related to that I don’t know about. I also thought it might, just might provide some areas of new research. Setup was easy. Download the app from the app store, connect the app to your Ancestry.Com account. Select a tree to use and select yourself from within that tree. Easy-peasy. Next, just look at the possible relationships. Select one and see a tree indicating the relationship. Here I go with some of my results. The first match I looked at was with Stephen King. Oh well. Not a likely match at all. We’re Related’s path to 7th cousin, once removed Stephen King went through my mother, her mother Madonna Montran, and her father, Max Fisher. Oops. Max Fisher was her step-father, not her biological father. Not even worth further research. I understand that Ancestry wants to provide all the famous matches that it can, but a fourth cousin of my grandmother’s step-father isn’t a relationship I have an interest spending any research time investigating or confirming. It might be that someone else has a tree that doesn’t define Max as a step-father. So, I’ve hidden this unlikely relationship. 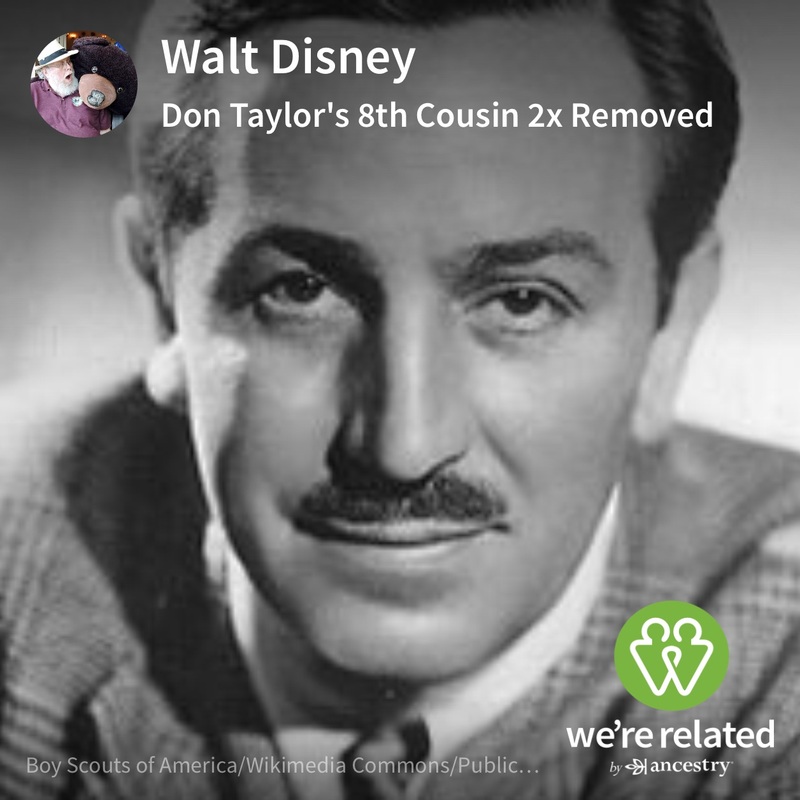 Next came Walt Disney, a 10th cousin 2x removed. A quick look at the ancestral path matched my Roberts Line. Then Joel Cruff Taft and six other ancestors I am not familiar with. Ancestry’s adding seven ancestors to my tree to get to a common ancestor with Walt Disney is disconcerting, but entertaining. It does provide areas for further research and will pursue it as a part of my standard ancestor research. I’d call my relationship with Walt Disney as a possible Relationship. The third famous individual I matched was 8th cousin, 1x removed, Britney Spears. This line followed my mother, her father, Richard Earl Brown, his mother, Mary Elizabeth Mannin[i], and her mother “Sarah J. Garvin.” Who? My research indicates that Mary Elizabeth Manning’s mother was Eliza Jane Fannin. I never heard of Sarah J. Gavin. So, I’m probably not related to Britney Spears. But the suggestion by “We’re Related” does give me pause to double check my sources for Mary Manning’s mother, but I’m pretty confident this is an unlikely relationship. Based on my Facebook friends, “We’re Related” suggests that I’m related to several friends. 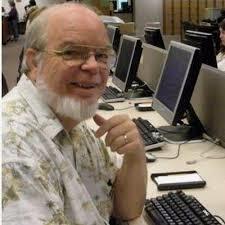 Most interesting is possible 9th cousin Randy Seaver. Yes, the same Randy Seaver whose blog, Genea-Musings, I follow and recommend. Following my tree up towards our shared ancestor, I see, my mother, her father, Richard Earl Brown, his father Arthur Durwood Brown, and his father, Henry Mack Brown. Oops. I’ve run into this relationship in several other trees and have investigated it. I am confident that William Henry Brown was Arthur Durwood Brown’s father and not Henry Mack Brown. I wrote about that relationship in, “W. Henry Brown (1843-c.1895). So, I believe this is an unlikely relationship, and certainly not through Henry Mack Brown. “We’re Related” is fun to look at the possibilities. It makes me think about key relationships in my tree and has the potential of providing clues into further research. It will be interesting to see what it shows when I look at my wife’s family tree using this app. I know of her relation with a couple of famous Swayze individuals. Will the app show those relationships? We will see…. [i] Mannin and Manning are used interchangeably. I tend to use whichever one that is used in the source that the information comes from.